Tucson Daily Photo ~: Baking for the holidays? 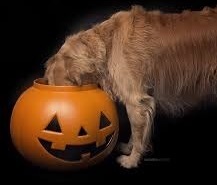 If your holiday baking includes baking for your pets, here is one of my favorite recipes for pumpkin dog treats. Your dogs will LOVE these! Mix pumpkin, molasses, vegetable oil, and water together in a bowl. Add flour, baking soda, baking powder, and cinnamon to mixture. Scoop out small spoonsful of dough and roll into balls on your hands (wet hands work best). Set the balls onto a lightly greased cookie sheet and flatten with a fork. Bake approximately 25 minutes until dough is hardened. Very special, very magical - Valley of the Moon! Restored Art Deco Treasure - the Fox! Did you know Santa is from Tucson? Tucson Style "T'was the Night Before...."
Tucson's French Market - TODAY! ONLY in Tucson! Who knew?